Enter the current balance of your savings account, or the initial deposit that is not part of the periodic deposits (without dollar sign or commas). This field is optional as long as you enter a periodic deposit amount. The calculator will need either a starting amount, a periodic deposit, or a combination of both, in order to calculate the interest earnings. Enter the annual interest rate that the savings account will be earning. Enter as a percentage but without the percent sign (for .02 or 2%, enter 2). Enter the number of selected periods (month or years) you would like the calculator to calculate interest for. Enter integers only (no decimal points). If you would like to calculate interest for partial years, select Months and enter the total months (example: for 5-1/2 years, enter 66 months). Select the frequency at which you plan to make deposits to your savings account. Enter the periodic deposit amount for the selected deposit frequency (without dollar sign or commas). Note that the calculator bases its calculations on 360-day years to accommodate daily compounding for monthly, semi-monthly, quarterly, and annual deposits, so please allow for weekly and bi-weekly annual deposit differences (52 weeks and 26 bi-weeks each add up to 364 days). 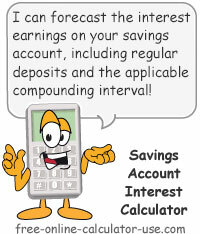 Select the compounding interval that applies to the savings account. Typically, the more frequent the compounding, the more interest you will earn when all other variables are equal. Based on your entries, this how much your savings account will have grown to for the number of entered months or years. Based on your entries, this is the total of your beginning amount plus all periodic deposits for the entered number of months or years. Based on your entries, this is the total interest you will earn on your savings account for the entered number of months or years. This calculator will calculate the compound interest earnings on saving accounts given the rate, length of time, initial deposit, periodic deposits, and compounding frequency. Plus, unlike some online saving compound interest calculators, the calculator on this page includes an option for calculating interest on savings accounts that offer daily compounding. And finally, the calculated results also includes an annual savings account growth chart showing the deposits, interest earnings, and balance for each year of the saving term. Enter a beginning balance if applicable. Enter the account's annual interest rate. Enter the number of months or years that you would like to calculate deposits and earnings for. Select the deposit frequency (how often you will be making a deposit to the account). Enter the amount you plan to deposit at the selected frequency. Click the "Calculate Savings Growth" button. This will display the future value, total deposits, and interest earnings, plus display a year-by-year savings growth chart. Interest that is not only earned on the amounts you deposit, but also on the previous interest the account has earned (earning interest on interest paid). The benefits of investing funds into a regular savings account. When most people think of savings accounts, they immediately think of these as being the poorest of all investments. And while they may be correct in terms of the lower interest rates offered, they are not considering all of the benefits of investing money into a regular savings account. Here are a few of the benefits that most people fail to consider. The savings account interest rate might be low, but where else can you store money where the safety of your money is guaranteed and insured? Having your funds federally insured against loss can give you peace of mind that you can't get from potential high yield investments that come with the constant fear of losing your principal. If you faithfully and continually contribute money to a savings account, over time you will be able to borrow money from yourself when you need it instead of paying interest on a bank loan, or worse, paying the outrageously high interest on a credit card balance. Becoming your own bank can save you thousands of dollars in interest charges over the course of your lifetime. If you faithfully and continually contribute money to a savings account, over time you will be able to increase the deductibles on your insurance policies (self-insurance against modest losses). This has the potential to save you thousands of dollars in auto, home, disability, and health insurance premiums over the course of your lifetime. Unlike most other types of investments, regular saving accounts don't come with early withdrawal penalties. If unforeseen events force you to withdraw your funds from a safe high yield investment that penalizes you for early withdrawal, you can end up earning less than what you could have earned on a regular savings account. All too often I witness people confusing a savings account with being a spending account. They put money in their savings only to drain the account before their deposits have any time to earn any interest at all. This is a very costly habit in terms of your financial future. A savings account is for saving money for the long term. So the only way to gain the value of a savings account is to NOT get into the habit of spending from it. Once you get into the habit of spending from your savings account it will be very hard to break. Therefore, if you think you might need the funds anytime soon (less than 5-years), I encourage to deposit the money into a checking account instead. "Save" your saving accounts for saving. Are You Using A Motor Home For Everyday Transportation? Please be aware that complaining about low savings account interest rates while paying 18% on credit card debt is like complaining about gas prices while using a motor home for everyday transportation. If you really want to do something about low savings rates and high borrowing rates ... stop borrowing and start saving!